Aldeburgh /ˈɔːlbrə/ is a coastal town in the English county of Suffolk. Located on the North Sea coast to the north of the River Alde, the town is notable for having been the home of composer Benjamin Britten and as the centre of the international Aldeburgh Festival of arts at nearby Snape Maltings founded by him in 1948. It remains an artistic and literary centre with an annual Poetry Festival and several food festivals as well as other cultural events. It is a former Tudor port and was granted Borough status in 1529 by Henry VIII. Its historic buildings include a 16th-century moot hall and a Napoleonic-era Martello Tower. Second homes make up roughly a third of the town's residential property. The town is a tourist destination with visitors attracted by its Blue Flag shingle beach and fisherman huts, where fresh fish are sold daily, and Aldeburgh Yacht Club as well as cultural attractions. Two family-run fish and chip shops are cited as among the best in the UK. Alde Burgh means "old fort" although this structure, along with much of the Tudor town, has now been lost to the sea. In the 16th century, Aldeburgh was a leading port, and had a flourishing ship-building industry. Sir Francis Drake's Greyhound and Pelican (later renamed the Golden Hind) were both built in Aldeburgh. The flagship of the Virginia Company, the Sea Venture is believed to have been built here in 1608. Aldeburgh's importance as a port declined as the River Alde silted up and larger ships could no longer berth. It survived mainly as a fishing village until the 19th century, when it also became a seaside resort. Much of its distinctive and whimsical architecture derives from that period. The river is now home to a yacht club and a sailing club. Aldeburgh is on the North Sea coast and is located around 87 miles (140 kilometres) north-east of London, 20 mi (32 km) north-east of Ipswich and 23 mi (37 km) south of Lowestoft. Locally it is 4 mi (6 km) south of the town of Leiston and 2 mi (3 km) south of the village of Thorpeness. It lies just to the north of the River Alde with the narrow shingle spit of Orford Ness all that stops the river meeting the sea at Aldeburgh - instead it flows another 9 mi (14 km) to the south-west. The beach is mainly shingle and wide in places with fishing boats able to be drawn up onto the beach above the high tide, but narrows at the neck of Orford Ness. The shingle bank allows access to the Ness from the north, passing a Martello tower and two yacht clubs at the site of the former village of Slaughden. Aldeburgh was flooded during the North Sea flood of 1953 and flood defences around the town were strengthened as a result. The beach was awarded the Blue flag rural beach award in 2005. The town is within the Suffolk Coast and Heaths Area of Outstanding Natural Beauty (AONB) and has a number of Sites of Special Scientific Interest (SSSI) and nature reserves in the local area. The Alde-Ore Estuary SSSI covers the area surrounding the river from Snape to its mouth, including the whole of Orford Ness. This contains a number of salt marsh and mudflat habitats. The Leiston-Aldeburgh SSSI extends from the northern edge of the town to cover a range of habitats including grazing marsh and heathland. It includes Thorpeness Mere and the North Warren RSPB reserve an area of wildlife and habitat conservation and nature trails run by the Royal Society for the Protection of Birds. Two smaller geological SSSI units are found on the southern edges of the town. Aldeburgh Brick Pit is a 0.84-hectare (2.1 acres) site showing a clear stratigraphy of Red Crag deposits above Corralline Crag. Aldeburgh Hall Pit is a shallow pit of 0.8 ha (2.0 acres) area. The site features a section of Corralline Crag and is considered one of the best sites in Britain for Neogene fauna. The town's churches include the pre-Reformation Anglican church of St Peter and St Paul and the Catholic Church of Our Lady and St Peter. Aldeburgh has a Town Council and lies within the Suffolk Coastal Non-metropolitan district. Aldeburgh ward, which includes Thorpeness and some other communities, had a population of 3225 in the 2011 census, when the mean age of the inhabitants was 55 and the median age 61. It is within the Suffolk Coastal parliamentary constituency represented by Therese Coffey, having had John Gummer for a member from 1983 to 2010. It is regarded as a safe seat for the Conservative Party. 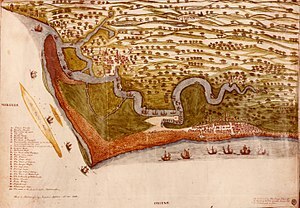 Aldeburgh was a Parliamentary Borough from 1571, and returned two Members of Parliament, the right to vote being vested in the freemen of the town. Latterly it was considered a rotten borough, and lost its representation under the Great Reform Act of 1832. In 1908 Aldeburgh became the first British town to elect a female mayor: Elizabeth Garrett Anderson. Her father, Newson Garrett, had been mayor in 1889. In 2006, Sam Wright became Aldeburgh's town crier and mace bearer – at 15 the youngest in the world. Aldeburgh is linked to the main A12 at Friday Street in Benhall by the A1094 road. The B1122 leads to Leiston. There are bus services to Leiston, southward to Woodbridge and Ipswich, and northward to Halesworth. The nearest railway station is at Saxmundham on the East Suffolk Line. This provides hourly services to Ipswich and Lowestoft. Aldeburgh railway station opened in 1860 as the terminus of the Aldeburgh Branch Line from Saxmundham, but was closed in 1966 under the Beeching Axe. The RNLI station located in the town was operating two lifeboats in 2016. The Aldeburgh Moot Hall is a Grade I listed timber-framed building which has been used for council meetings for over 400 years. The Town Clerk's office is still there and it also houses the local museum. It was built in about 1520 and altered in 1654. The brick and stone infilling of the ground floor is later. The hall was restored and the external staircase and gable ends were rebuilt in 1854–55, under the direction of R. M. Phipson, chief architect of the Diocese of Norwich, in which Aldeburgh then stood. There are 64 other listed historic buildings and monuments in the town. A unique quatrefoil Martello Tower stands at the isthmus leading to the Orford Ness shingle spit. It is the largest and northernmost of 103 English defensive towers built between 1808 and 1812 to resist a Napoleonic invasion. The Landmark Trust now runs it as holiday apartments. From May 2015-May 2016 an Antony Gormley statue is on display on the roof as part of his LAND art-installation. The Martello Tower is the only surviving building of the fishing village of Slaughden, which had been washed away by the North Sea by 1936. Near the Martello Tower at Slaughden Quay are the barely visible remains of the fishing smack Ionia. It had become stuck in the treacherous mud of the River Alde, and was then used as a houseboat. In 1974 it was burnt, as it had become too unsafe. The four-storey windmill at the southern end of the town was built in 1824 and converted into a house in 1902. A WW2 tank trap can be seen next to Slaughden Road. On Aldeburgh's beach, a short distance north of the town centre, stands a sculpture, The Scallop, dedicated to Benjamin Britten, who used to walk along the beach in the afternoons. Created from stainless steel by Suffolk-based artist Maggi Hambling, it stands 15 feet (4.6 metres) high, and was unveiled in November 2003. The piece is made up of two interlocking scallop shells, each broken, the upright shell being pierced with the words: "I hear those voices that will not be drowned", which are taken from Britten's opera Peter Grimes. The sculpture is meant to be enjoyed both visually and tactilely, and people are encouraged to sit on it and watch the sea. Approached along the road from the Thorpeness direction it has a totally different silhouette appearing to be a knight on a rearing charger. The sculpture is controversial in the local area, with some local residents considering it spoiling the beach. It has been vandalised with graffiti and paint on 13 occasions. There have been petitions for its removal and for its retention. Elizabeth Garrett Anderson was the first Englishwoman to qualify as a physician and surgeon in Britain, the co-founder of the first hospital staffed by women, the first dean of a British medical school, the first female doctor of medicine in France, the first woman in Britain to be elected to a school board and, as Mayor of Aldeburgh, the first female mayor and magistrate in Britain. The poet George Crabbe was born in Aldeburgh in 1754 and the town forms a loose basis for his poems The Village and The Borough. The latter contains the tale of a fisherman named Peter Grimes, on which Benjamin Britten's opera was based. Novelist Annie Hall Cudlip was born in Aldeburgh in 1838. Dame Millicent Garrett Fawcett (1847–1929), suffragist, intellectual, political and trade union leader, feminist and writer, was born in Aldeburgh. Benjamin Britten became a resident of the town in 1942. In 1948, along with Eric Crozier and Peter Pears, he founded the Aldeburgh Festival and Aldeburgh Music Club in 1952. Britten died in Aldeburgh in 1976. Pears, Britten's lifelong partner, also died in Aldeburgh in 1986. They are buried alongside each other in the churchyard of St Peter and St Paul's Church in the town. Joan Cross, English soprano and theatre director (1900–1993), who created several roles in Britten's operas, is buried in the same cemetery. Songwriter Peter Sinfield, founding member and lyricist for progressive rock act King Crimson, currently resides in Aldeburgh. Rt Revd Sandy Millar, former Vicar of Holy Trinity Brompton and co-founder of the Alpha Course, currently lives in Aldeburgh. Footballer Roy Keane became an Aldeburgh resident in 2009 following his appointment as manager of Ipswich Town. Isabella Summers (Florence and the Machine), songwriter, producer, and remixer, is a native of Aldeburgh. M.R. James was a regular visitor to his maternal grandmother who lived in Aldeburgh until her death in 1870. He set one of his stories, "A Warning to the Curious", in a disguised version of Aldeburgh, which he called "Seaburgh". Many of the town's landmarks such as the Martello tower and White Lion hotel feature. Composer Cevanne Horrocks-Hopayian lives in Aldeburgh, on the border with Thorpeness. In recent years the town and region have attracted a number of artists including Young British Artists members Sarah Lucas, Abigail Lane, Gary Hume and Gavin Turk. Outside the town, the Snape Maltings is the venue for the Aldeburgh Festival held every June. Aldeburgh Music Club was founded by Benjamin Britten and Peter Pears in 1952. The Club has evolved over the years into one of East Anglia's leading choirs with about 100 members and supported by over 120 patrons. The choir rehearses from early September to late May each year and holds three major performances, two of which are at Snape Maltings Concert Hall. The annual Aldeburgh Carnival in August has taken place at least since 1892 and possibly as far back as 1832, when "Ye Olde Marine Regatta" was mentioned. The focal point today is a Carnival Procession featuring locals and visitors dressed in home-made costumes and on floats, often with a topical or local theme. In the evening, a parade with Chinese lanterns and a firework display are traditional. The procession has been led for over 30 years by Chief Marshal Trevor Harvey, also a Carnival Committee member for over 50 years. The Suffolk Craft Society hold an annual themed exhibition in the Peter Pears Gallery over July and August, showing the work of its members. The town of Aldeburgh or "Owlbarrow" is the setting of a series of children's illustrated books centred on Orlando (The Marmalade Cat) written by Kathleen Hale, who spent holidays in the town. Many of the illustrations in the books feature landmarks in the town, most notably the Moot Hall. The town also features in the thriller Cross of Fire written by novelist Colin Forbes, as do the nearby villages of Dunwich, Snape Maltings. James Herbert based his book The Jonah in the area, using several names represented in the local area for characters including Slaughden. Aldeburgh appears as a location in Joseph Freeman's novel Arcadia Lodge, where it is referred to as "Seaburgh", as it is in the M. R. James story "A Warning To The Curious". The Maggi Hambling sculpture features in an early scene, as do various other notable landmarks. Aldeburgh is notable for its line fishing for amateur anglers; it has been described as "a great spot for bass, flounders, sole, dabs, cod, whiting and eels". However, the East Anglian Daily Times says "countless years of commercial over-fishing has all but destroyed many of our [Suffolk's] offshore sea fisheries" and traditional, sustainable inshore fishing is under threat, with likely knock-on effects for the coastal community. Local fishermen have featured in the "Fish Fight" campaigns of Hugh Fearnley-Whittingstall and Greenpeace, supporting small-scale inshore fishermen. Aldeburgh is now home to Aldeburgh and Thorpeness Rugby Club, based at Kings Field in Aldeburgh. The club runs an adult team in the Eastern Counties Leagues, an Under 15s team, Midi/Mini rugby, and Women's touch rugby. The club started out in nearby Thorpeness and moved in 2015 to work with Aldeburgh Town Council and Aldeburgh Community Centre. These include Aldeburgh Cottage Hospital, a traditional English cottage hospital, the Aldeburgh Library, which also relies on volunteers, and the Aldeburgh Cinema, which puts on a broad programme of films and cultural events. ^ "Town population 2011". http://www.neighbourhood.statistics.gov.uk/dissemination/LeadKeyFigures.do?a=7&b=11119884&c=Aldeburgh&d=16&e=62&g=6466913&i=1001x1003x1032x1004&m=0&r=1&s=1442224122316&enc=1. Retrieved 14 September 2015. ^ a b Aldeburgh Town Council. Retrieved 2016-01-09. ^ a b Brown, Griselda Murray. "Follow the music". 1 March 2013. ft.com. http://www.ft.com/intl/cms/s/2/eeec7aa2-7b84-11e2-8eb3-00144feabdc0.html#axzz2MMsDkPDc. Retrieved 3 March 2013. ^ Newsham, Gavin (10 February 2002). "Top 10 chip shops". The Guardian (London). Archived from the original on 14 April 2010. https://web.archive.org/web/20100414023640/http://www.guardian.co.uk/lifeandstyle/2002/feb/10/foodanddrink.features14. Retrieved 23 April 2010. ^ Alde and Ore estuary gets new flood defence partnership, BBC Suffolk news website, 2012-05-17. Retrieved 2013-01-30. ^ Alde-Ore Estuary, SSSI citation, Natural England. Retrieved 2013-01-30. ^ Leiston-Aldeburgh, SSSI map, Nature on the map, Natural England. Retrieved 2013-01-30. ^ a b Leiston-Aldeburgh, SSSI citation, Natural England. Retrieved 2013-01-30. ^ The RSPB: North Warren, Royal Society for the Protection of Birds. Retrieved 2010-05-17. ^ Aldeburgh Brick Pit, SSSI citation, Natural England. Retrieved 2013-01-30. ^ Aldeburgh Hall Pit, SSSI citation, Natural England. Retrieved 2013-01-30. ^ Aldeburgh demographics. Retrieved 15 December 2014. ^ Rain fails to take shine off carnival Retrieved 22 August 2006. ^ a b Saxmundham, Leiston, Aldeburgh and surrounding area, Suffolk County Council. Retrieved 2013-02-01. ^ Aldeburgh, National Rail. Retrieved 2013-02-01. ^ The English Heritage site gives an architectural description of each: Retrieved 30 July 2011. ^ "The Landmark Trust | Martello Tower". Bookings.landmarktrust.org.uk. http://www.landmarktrust.org.uk/search-and-book/properties/martello-tower-9317. Retrieved 2012-08-07. ^ "Tank Barrier Aldeburgh". tracesofwar.com. http://en.tracesofwar.com/article/23964/Tank-Barrier-Aldeburgh.htm. Retrieved 18 June 2013. ^ a b c d "Aldeburgh: Scallop vandal fails to cover their tracks". East Anglian Daily times. http://www.eadt.co.uk/news/aldeburgh_scallop_vandal_fails_to_cover_their_tracks_1_1168800. Retrieved 4 February 2013. ^ "The Aldeburgh Scallop: Have your say!". BBC Suffolk. http://www.bbc.co.uk/suffolk/content/articles/2004/11/08/scallop_aldeburgh_feature.shtml. Retrieved 4 February 2013. ^ "BBC - History - Elizabeth Garrett Anderson". http://www.bbc.co.uk/history/historic_figures/garrett_anderson_elizabeth.shtml. ^ Morrison, Blake (2013-06-14). "George Crabbe: The man behind Benjamin Britten" (in en-GB). The Guardian. ISSN 0261-3077. http://www.theguardian.com/books/2013/jun/14/britten-george-crabbe-drowned-voice. ^ "Britten Biographical Information". http://www.its.caltech.edu/~tan/Britten/britbio.html. ^ "Joan Cross (1900 - 1993) - Find A Grave Memorial". http://www.findagrave.com/cgi-bin/fg.cgi?page=gr&GRid=6826022. ^ "Aldeburgh Celebrity Walk | Aldeburgh Tourist Information 2016". http://www.lovealdeburgh.co.uk/things-to-do/aldeburgh-celebrity-walk. ^ Football, Mirror. "Ipswich slam reports that manager Roy Keane is about to lose his job". http://www.mirror.co.uk/sport/football/news/ipswich-slam-reports-manager-roy-3370281. ^ Barnes, By Jonathan. "Aldeburgh: Florence and the Machine writer set to release new music". http://www.edp24.co.uk/going-out/aldeburgh_florence_and_the_machine_writer_set_to_release_new_music_1_769911. ^ The Haunted Dolls' House and Other Ghost Stories, Penguin Press 2006. ^ Cevanne Horrocks-Hopayian reference, bbc.co.uk; accessed 2 May 2015. ^ "Aldeburgh, Suffolk". Aldeburgh Carnival. http://www.aldeburghcarnival.com/. Retrieved 2012-08-07. ^ Diwekar, Rujuta. "Cross of Fire 0330322419: Book: COLIN FORBES (9780330322416)". Flipkart.com. http://www.flipkart.com/cross-fire-colin-forbes/0330322419-4tw3f9a26g. Retrieved 2012-08-07. ^ a b "A guide to fishing in Suffolk". East Anglian Daily Times. http://suffolk.greatbritishlife.co.uk/article/guide-to-fishing-on-the-suffolk-coast-cook-eat-23661/. Retrieved 4 February 2013. ^ "2011 Conference: An Appetite for Change: Suffolk & the Sea". Aldeburgh Food & Drink Festival. http://www.aldeburghfoodanddrink.co.uk/conference/programme/. Retrieved 4 February 2013. ^ "The Last Fishermen". Greenpeace UK. http://www.greenpeace.org.uk/last-fishermen-film. Retrieved 4 February 2013. ^ "Hugh Fearnley Whittingstall's Fish Fight and Greenpeace in association with NUTFA (the New Under Ten Fishermen's Association) are campaigning to support the UK inshore fishing industry. ""From ship to Shaw". Places & Faces Magazine. http://www.placesandfaces.co.uk/articles/1015/from-ship-to-shaw.html. Retrieved 4 February 2013. Kate Pugh: Return to Suffolk, 2007 Crabbe 1792–1805. Bottesford Living History Community Heritage Project on the poet George Crabbe. 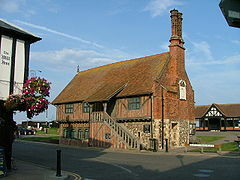 Wikivoyage has a travel guide for Aldeburgh. This page uses content from the English language Wikipedia. The original content was at Aldeburgh. The list of authors can be seen in the page history. As with this Familypedia wiki, the content of Wikipedia is available under the Creative Commons License.